Long story short, thanks, Shannon Hale, and thanks, Liz, for sharing your thoughts on Shannon's book! Check out what Liz has to say on both the book and the trailer for the movie, below! I know what it’s like to be an Austen fangirl. I may not be as extreme as Jane Hayes, but there are days when I wish I could build my own boyfriend instead of dealing with real guys—you know, like a Build-A-Bear, or a Mr. Potato Head. 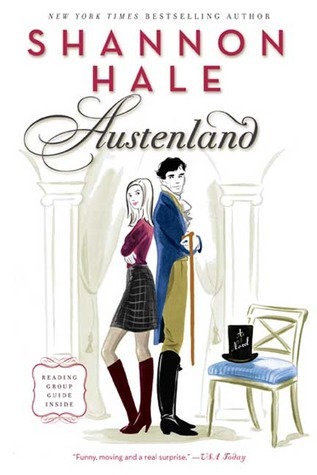 I went into Austenland hoping for a run romp through Regency England, but Hale tackled the subject of fandom more seriously than that. Hale’s pacing was off at times, but I enjoyed the fact that she wrote a thoughtful novel about what Jane really wanted while still filling the book with fun and humor. When we were introduced to Jane, I thought we learned more about her feelings about her Austen-love then about the degree. We know that she watches her Pride and Prejudice DVD a lot, but that she also hides it in a potted plant. Furthermore, the trip she takes to England isn’t something she’s sure of, nor is it entirely voluntary—she does it because it’s already booked and because maybe she can get some closure. Jane often grapples with what’s real in Austenland and what’s not. Who’s being nice to her because they’re being paid? Who can she genuinely trust? It’s a question that leaves the reader thinking in a good way. Had this not been well done, I probably would’ve been thinking, “Hale, make up your mind about what you’ll be doing with these people!” Instead, it made me think hard about not only as how Jane perceived reality, and what she perceived as reality. This topic would make for fantastic book club fodder. The characters in Austenland take part in some Regency England activity. Hale’s writing is infused with wit and humor, so for the most part, this was enjoyable. There were, however, a few spots that felt really slow. Between the chapters, we learn about Jane’s ex-boyfriends, and a lot of them are not nice guys. Jane is not just an Austen fanatic—she’s someone who has been burnt before, and who’s probably afraid it will happen again. This part of the novel really helps readers empathize for Jane. Austenland hit real trouble towards the end. While I liked how the story ended, the ending happened very quickly. It was very romantic, but I think adding another chapter or two would have made it feel much more believable. Overall, I enjoyed Austenland. It wasn’t a perfect book, but the amount of thought-provoking content was balanced nicely with the escapist elements of the story. As you all know, this is just now hitting theaters as a movie, so I thought I’d give you my thoughts on the trailer. For me, the fact that this fandom totally consumes Jane’s life is much more obvious in the trailer. We clearly see that Mr. Darcy consumes most of her waking thoughts, and can tell that she’s a lot more fanatical than most Austen fans. As soon as we reach the point of the trailer where Jane gets to Austenland, we can tell how much fun the parts of the movie set in Regency England will be. The trailer looks like it will make for a great movie, and I feel that it hints at the movie having a different tone. For example, at one point I believe we hear Jane say, “So mad I wasted all my money.” So, is the relative who gifts Jane the vacation not featured in the film, or does she give Jane cash rather than buying the vacation for her? She also mentions really wanting to get engaged, whereas in the book she hopes that maybe her trip will help her get the Austen obsession out of her system. It leaves me with a big question: how do Jane’s intentions transform once she’s on the silver screen, and does that make her more or less palatable as a character? We also see both of the love interests in the trailer, and in terms of appearance, they’ve both earned my swoons. Personally, I picked up on the pensive but genuine vibe from Mr. Nobley much faster in the trailer than in the book. I have a feeling I’ll be needing one of my own after I see the movie. Overall, the trailer holds a lot of promise, and I may end up liking the movie more than the book. We’ll have to wait and see! Hmm I've heard of Austenland but never looked at it any closer until this post. I'm not sure it's my style, but I like that there's a book about fandoms. The movie entices me a bit more than the book does too. When I read the book I imagined Jennifer Coolidge as the other woman staying with Jane (can't remember her name right now) so that is perfect. I also love Keri Russell so I will totally be watching the movie. I think it looks like more fun than the book. I thought at times that the book was a bit boring and I wanted more people around. I also found it weird the in the book Jane seemed embarrassed by her Darcy love. I didn't understand her hiding the movie in the flower pot. I liked the book overall but judging just from the trailer I may like the movie more! I have the book, picked it up when it was kindle deal of the day, but I've not read it yet. I'd like to read it before seeing the film as it will give me a chance to imagine the characters before they are imagined for me. I really enjoyed the book (I read it in one night) and saw a lot of myself in Jane, as a burned 30-year-old who made a bad habit of trusting the wrong men. I also liked Hale's quips, though I agree with your assessment of the ending. From the trailer, I think they've given the book a romcom treatment that will make it less savory and impactful than the book was- it looks like more of a cotton candy romp with a possible mocking of Austen fans. I'll still see it, but my expectations are low. I haven't read the book yet, but it is on my wish list. The movie looks good, but I do want to read the book first or I might really think the pace is slow after the movie's pace. Thanks for sharing your thoughts, Liz. I loved AUSTENLAND. Oh, I have such fond memories! I really do need to reread it, though. I can't wait until the movie comes out here. I feel like I've been looking forward to it for ages and I am curious about the differences - the same line you mentioned about wasting her money, Liz, made me wonder how much they've changed. I haven't yet read the second AUSTENLAND book. I need to get that! I have never read this book but I have it ordered. I love this trailer, I can't wait to see the movie! I can't believe I never heard that there was going to be a movie !! Yay for your blog!! I honestly didn't like the book. I didn't like the way Austenland was a fantasy land for sad sacks with no real lives. I hated the way the actors were paid to be Austen heroes and villains. The second book is better for the mystery and character growth but I still don't like Austenland.